Looks like a handmade original. Contact SVP. Get a list of all participants that year who attended. Then do mass mailout to those participants. Something to consider: if you imagine that a 100 years from now that someone will be leafing through your notebook in the archives of some museum or university, then you need to consider the paper, namely that it is of archival quality. You may love the notebook you are asking about, but it may not be archival (might become brittle, crumble, etc.). 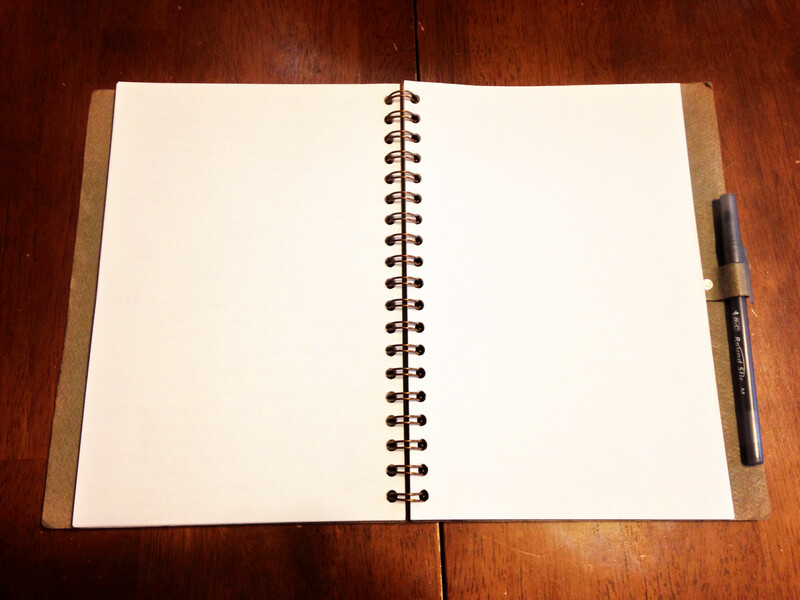 You can, of course, make your own spiral notebook by buying a ream of archival paper of the heaviness you like (cotton linen , cutting it to dimensions you like with a paper cutter, then having that bound with a heavy archival card stock cover. Most copy centers (like Kinkos) can help with all of this (paper, cutting, binding). A rubber band is great for keeping it closed in your backpack while traveling. Or use a ziploc bag. Knee jerk response of a DIYer: if you had to, reloading is probably an option, as long as you or a friend or institution had the right tools, or if the right parts could be found ahead of time: if there’s a notebook with similar-enough pages, you’ve got the paper refill (discard the rest, or donate to a local preschool or K for crafting); I know plastic spines are easy to come by, I’d guess metal ones also if (I assume this is how they work at manufacture) you carefully bent them into place, presumably with a piece of wood to press them all evenly. But that’s a neat cover for sure! Ah, comments are posted below the “post a comment”, so what Ken said, except see if kinkos can simply reload with whatever paper you want, while also binding the old one in a perhaps-less convenient cover for even just temporary archiving. Or digital archiving? On a past thread about Dyson Spheres. I thought over what you said. Better mining black holes for energy than building a Dyson Sphere. Black Hole to use it using prodigious amounts of matter. I just don’t think a Dyson Sphere would be built to simply live off the energy of star light. Think of it as a biological thing. We consume carbs to release sugars slowly so that we can endure over long periods of time. One of the problems we face today is overpopulation. Once we advance into space, the foot is off the break once more. Reproduction is the key for Dyson Spheres. I doubt if people actually colonize their solar systems. The planets would be used as mining platforms for materials for a Dyson Sphere. The metalurgy would be advanced with super-light, super strong material composites. Perhaps the Spheres would be used for a pop. of 10 trillion inhabitants. Such a population explosion would be cultural in extent. If so, you want a source of energy that is continuous over very long periods of time. Black Holes would be used for high end experimental purposes, even mining. So I wouldn’t rule out the Dyson quite yet. I like the idea of researchers scouring our notebooks for nuggets of wisdom in a hundred years :-) But realistically, I think they’re far more likely to work with scans. Matt and I both routinely photograph all the pages of our notebooks at the end of research trip. I suppose we should get in the habit of posting them all somewhere public when we do. Mike, maybe they will work with scans, or maybe they won’t. We really don’t know how archival our digital data really is. Look what eventually was discovered with CDs & DVDs – maybe 25 – 50 years. When (not so much if) a nuke or two or more is/are detonated (by accident or rage – clown in the Whitehouse), the electromagnetic pulse may make a lot of digital data go away. There really is much to be said about hard copy storage (which governments do). Thanks, everyone, for the responses so far. Regarding digital and physical archiving: I try to do both. Regarding DIYing a similar notebook: I’m sure I could, but I’m pretty much operating at capacity these days, and if I could just buy another one like this I’d strongly prefer to do that. Then I could use the time I saved to do more science, or more blogging. As far as reloading the existing notebook, that is a great idea that had not occurred to me. I’d still rather just get another, but that’s Plan B at this point. Dale’s comment about Dyson Spheres relates back to the comment thread on this post. Since this post is about finding a particular notebook, rather than finding lebensraum for transhumans, please leave any further comments on that topic on that other comment thread. I’m going to delete any more that show up here because I want to keep this comment thread on track. Thanks for understanding. The embossing might be a clue to finding the notebook. Someone went through the trouble of converting the fish image into a format suitable for embossing. Also, the fact that it is embossed points to the possibility that they used a print service online i.e. something akin to vistaprint. 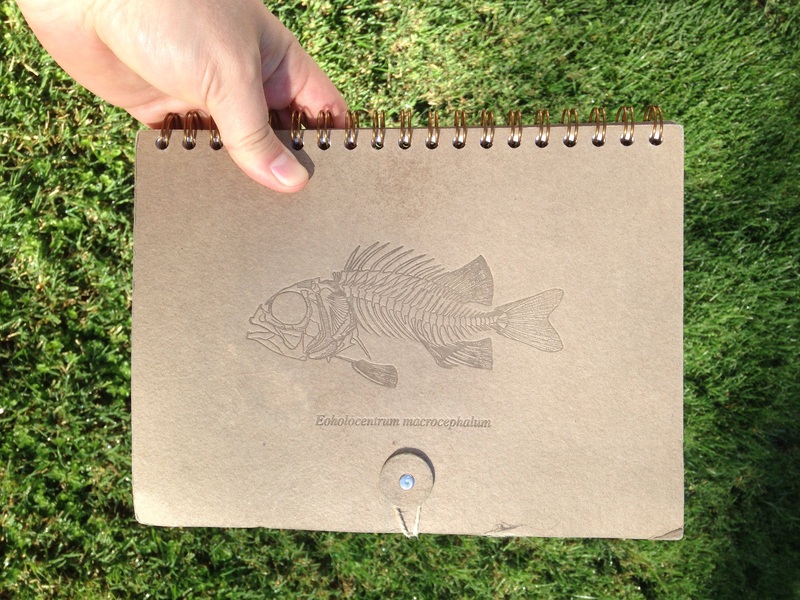 You could look around those sites for similar notebook designs, and you could put out a notice looking for the individual who created the fish design. That person might be able to point you to the person who needed the image for the notebooks. I don’t have an answer, but I do have a suggestion–take the clearest picture you can of the cover (cropped, thumb free) and plug that into Google Images and see if it comes up with any hits. It could work if there are sufficiently similar images on the sales site. « What should we do now Beall’s List has gone?